While Leovegas wasn’t founded until 2012, they’ve made quite the name for themselves. They are known to be one of the best places to try your luck on the internet, especially when it comes to creativity and innovativeness. And that of course also means they have received plenty of different awards. The eGaming Review (EGR) awards ended up with this operator plenty of time through the years and for many different reasons. Most of these awards were for mobile gaming, but even the general ‘casino operator of the year’ award has ended up in their cabinet! 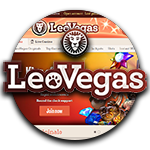 When you register an account as a new player at Leovegas then you will be offered a huge welcome bonus. This isn’t just one offer on your first deposit by the way, because you will be rewarded four times in a row! On your first deposit you will get 100% bonus up to a maximum of 50 euro, which means they will double your money, and there is much more to come after that. Because you will also receive 50% bonus up to a maximum of 150 euro on your second deposit, 50% bonus up to 200 euro on your third deposit, as well as 25% up to a maximum of 300 euro on your fourth deposit. That means they will provide you with up to 700 euro of additional playing money, guaranteed! Not enough? Don’t worry, because after that you will also get to benefit from plenty of interesting promotional offers which will come your way on a very regular basis! This includes things like extra bonuses, free spins offers, and of course a very nice VIP-program with which you can build up your player level at a gradual pace. The variety of casino games is one of the most impressive properties of Leovegas. Every player has different preferences when it comes to slots, videoslots and table games, and at this online casino you will always find something, regardless of what you like. On their website you will find games that were developed by brands like Evolution Gaming, Netent, NYX, Quickspin, Yggdrasil, Microgaming, Play’n Go, WMS and many more. That means you can easily find your favourite slots by entering its name in the search bar, while there are also plenty of other games to be discovered. Obviously, Leovegas has decided to categorise all of its games. Because it they didn’t then you simply wouldn’t know where to start! There are well over a thousand different slots to be found at this online casino, after all… And even though the selection of slots is absolutely out of this world, you will also get to enjoy a prime live casino experience. This operator has pretty much every type of table game that you would expect and your game sessions will be streamed live from their studios in Malta. This of course includes live roulette, live blackjack and other types of card games like live Texas Hold’Em Bonus Poker and silent blackjack. And as if that isn’t enough, there are also several tables which are exclusive to this particular casino. When you see advertisement banners for Leovegas then you will often see the term ‘king of the mobile casinos’ pop up. They generally focus quite a lot on this specific aspect, which becomes pretty obvious when you start playing for real money with your mobile device, like with your smartphone or tablet. Their mobile casino is optimised very well, with perfect responsiveness and accessibility. Also, mobile gamblers will get a chance to play directly through a specific Leovegas app. This app can be found through their website by going to the info page, while you can also find it in the App Store and the Play Store, respectively. That means you can try your luck at Leovegas with iOS and Android devices without ever opening your web browser! If that isn’t really your cup of tea then you can simply decide not to use their app, though, because this is completely optional. Their website works just as well and it is just as safe, as it is secured with SSL encryption. For all that matters, you won´t need to worry about safety or customer service at Leovegas at all. They have a range of licenses from the MGA and the UK Gambling Commission, they have been proven fair by independent audits, and they process withdrawals within 24 hours. Do you have any further questions? Then you can simply contact their highly trained their customer support team which is available via live chat, UK freephone, international phone and via email 24 hours per day and 7 days per week!